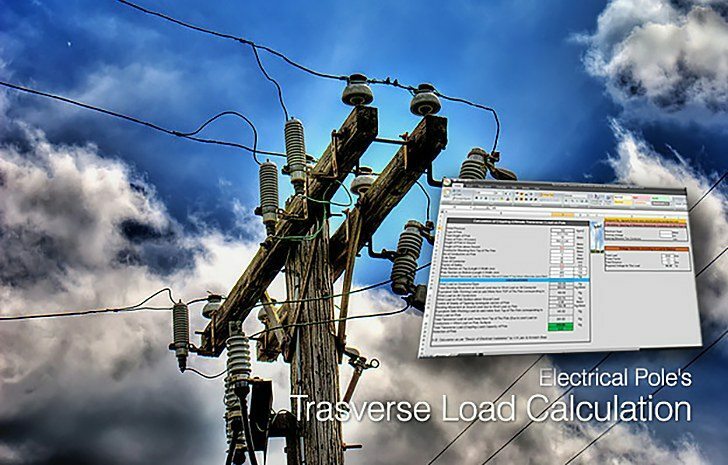 Transverse loads are forces acting upon pole line. Function of electrical pole is that of a cantilever beam rather than of a column. External forces are due to dead, ice and wind loads, which with the exception of the pressure on the pole must be transmitted to the pole by the wires. The weight of the wires and their coating of sleet, together with the weight of crossarms, insulators and the pole itself is a vertical load which the pole carries as a column. The pressure of the wind on the wires, whose diameter is increased by the sleet, and upon the pole structure, is assumed as acting horizontally and at a right angle with the line, and therefore its effect is much greater than the effect of the vertical forces. When poles are closely spaced there is undoubtedly some sideguying effect due to lateral restraint from the wires. That is, when one pole is subjected to a severe gust of wind, the neighboring poles will be brought into action, to a limited extent, by the wires spreading out some of the load to adjacent poles. these sheets are very impressive and informative. but how i can access them without password….??? Can someone explain what does Pole Section on Top (Length X Width )mm refer too? 1 – Poste Tubular de acero 8.23 m e.c. 116 kg. (27 pies – liviano). Cant. 118 Und. 2 – Poste tubular de acero 11,28 m, e.c. = 211 kg (37 pies – liviano). Cant. 300 Und. 3 – Poste tubular de acero 12.20 m, e.c. = 282 kg (40 pies – liviano). Cant. 500 Und. 4 – Poste tubular de acero 13,72 m, e.c. = 250 kg (45 pies – liviano). Cant. 105 Und. power transmission voltage level is for single phase or three phase?? where did you get the factor of safety? any reference?